Pulse code modulation (PCM) of voice frequencies. Operating at a 16-kHz sampling rate, G.711.1 produces three bitstreams in three layers. 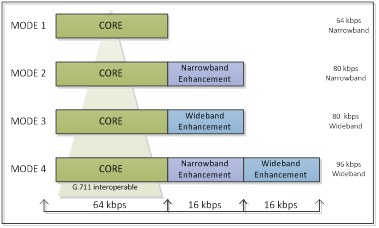 The core layer, operating at 64 kbps, is bitstream interoperable with G.711 (mode 1). Two other layers enhance the fidelity of the output to the original signal. The first one enhances the lower-band part of the signal in a 16-kbps bitstream (mode 2), and the second encodes the higher-band, that is, wideband, part (4000–7000 Hz) in a second 16-kbps bitstream (mode 3). The core layer is always delivered, and either one or both of the upper layers can also be delivered (mode 4), resulting in four possible modes of the G.711.1 codec, as shown in the figure above. ADT G.711.1 is available on the above Platforms: Other configurations are available upon request. The G.711.1 wideband extension of G.711 adds noise feedback and a lower-band enhancement layer, as well as a high band encoding layer. The main feature of this extension is to give wideband scalability to ITU-T G.711*, the most widely deployed speech codec. It aims to achieve high-quality speech services over broadband networks, particularly for IP phone and multi-point speech conferencing, while enabling a seamless interoperability with conventional terminals and systems equipped only with G.711. G.711.1 achieves this interoperability with legacy narrowband terminals and equipment through an embedded, layered architecture. G.711.1 encoder and decoder meet all ITU G.711.1 compliance and interoperability requirements.